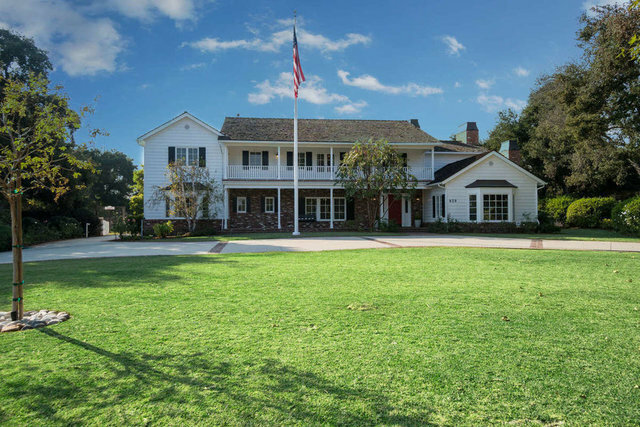 Located in the coveted Chapman Woods neighborhood of Pasadena, this East Coast-style Farmhouse marries authentic finishes with coastal contemporary flair for a refined spin on California living. Set upon 1.58 expansive and flat acres, the home features an open-concept floor plan replete with rustic wood details spanning from the white paneled walls to dark wood kitchen beams and dual living spaces bedecked in oak milled from fallen trees on the estate. From the foyer, one is led into the great room with a custom-tile fireplace and onward into the dining room, state-of-the-art kitchen and quaint breakfast nook. The home features seven bedrooms, including the tranquil master suite, and nearly two of everything, from laundry rooms to dishwashers, ovens and more—a true entertainer's dream. Beyond the interior lies an outdoor haven for both kids and adults alike, complete with a pool, junior-size baseball field, batting cage, lighted tennis court, herb garden and seemingly boundless lawn. The estate also comes with a guest home that boasts its own entrance and garage. Here, one has the opportunity to realize a legacy compound for generations to enjoy, all amidst a verdantly secluded and supremely convenient Los Angeles locale.